Facts about Zinnia Flower (Plant), "Sientific name for Zinnia Flower (Plant) is Zinnia hybrids". The colorful Zinnia Flower (Plant) is a native to Mexico, Southwestern parts of United States and South America. The flower was given its name in the year 1763 to honor the German botanist Johann Gottfried Zinn. The word “Zinnias” in the Victorian language meant the “thoughts of an absent friend”. It is quite interesting to note that the early Spanish colonists who landed in Mexico found this particular flower to be ugly and termed them as “mal de ojos” or evil eyes. There are twenty species of Zinnia Flower (Plant) which include single as well as double blooms. Most of the species of the Zinnia Flower (Plant) have upright stem and can range from 4 to 40 inches (10 to 100 cm) in height. One of the most popular species of this particular flower is Zinnia elegans. The Zinnia Flower (Plant) are available in a wide range of colors like lilac, white, yellow, purple, chartreuse, red, and orange. Growing Zinnia Flower (Plant) is absolutely hassle free, all that is need is well drained soil and full sun. People living in warm areas can sow Zinnia seeds directly in the garden soil. The soil must be loose and free from large clumps. After sowing the seeds they should be covered with 1/4 inch of soil as the seeds require light to germinate. The soil should be well drained until the Zinnia Flower (Plant) are 1/4 to 3/4 (one or two cm) tall. People living in cold regions can also grow this plant. They can sow the seeds of the Zinnia Flower (Plant) almost four to five weeks before the last anticipated frost, in well drained fertile soil. 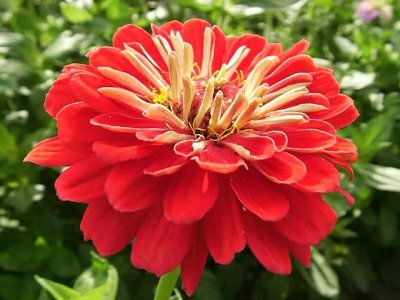 People can also buy Zinnia Flower (Plant) from nurseries and transplant then in fertile soil. The Zinnia Flower (Plant) are susceptible to mildew but they do not have any major insect problem. The Zinnia Flower (Plant) are largely used as boarder pants or cut flowers. Zinnias are also treated a companion plants and are often found in vegetable gardens. The Zinnia Flower (Plant) attract hover flies and predatory wasps which eat insects that destroy garden plants. The Zinnia Flower (Plant) also dissuade tomato worms and cucumber beetles. They also attract hummingbirds which eat whiteflies; this in turn saves tomato, cucumber and potato plants.